Tonight saw the final part of my client’s 10 hour course in Western Boxing for Martial Arts Cross Training. From the beginning of this course, my client’s objective has been to learn the sport of Mixed Martial Arts. Tonight we put everything together and sparred for 5 x 3 minute rounds. The lesson began with a warm-up of mirror footwork and slipping. This is a great form of attribute training that enables a student to focus on the way they move around in a fight. We then layered this onto focus mitt work. 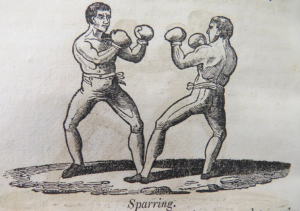 All punches were revised in isolation and then incorporated into basic combinations before being put into various tactics covered in the previous lessons. Round 2 – Increasing pressure. Round 3 – Working with different styles and tactics. Round 4 – Fighting into and out of corners. Round 5 – Dealing with and using the clinch.